Which people are the famous people of Amsterdam? Famous People: Although she was not born in Amsterdam, Anne Frank is still a very well known name associated with the city. Anne was born in Frankfurt but settled in Amsterdam with her family in 1933 to escape Nazi Germany. The Franks were a Jewish family and in July 1942 were forced into hiding in the back of an office building in Amsterdam to evade capture from the Gestapo. The Franks cleverly disguised areas in the office building and were able to remain undiscovered until August 1944. During her time in hiding, Anne kept a diary and wrote about her experiences. It is thought that Anne died in a Nazi concentration camp less than a year after her capture. Her diary was discovered in the hidden area of the office building in Amsterdam, it was later published and became one of the best selling books of all time. The hiding place that the Franks created is now a museum and is open to the public in the city of Amsterdam. Johan Cruijff is thought of globally as one of the best football players of all time. He was born in Amsterdam in 1947 and played for the Ajax Football Club. Cruijff played for the Ajax during their best years, where the club won a great number of international and national tournaments. Cruijff won the Ballon d’Or (an award given to the best international players) three times in the 1970s and later went on to become an internationally recognised football coach. Although many may be unaware of John de Mol, he is in fact a very influential figure in the world of reality television. In 1999 de Mol devised what went on to become an international series named Big Brother. The shows premise was to see how 12 strangers would cope when locked in a house together with cameras documenting their every move. Contestants also have to complete tasks in order to win basic luxuries such as food and alcohol. The show was a big hit, and since 2000 has been aired in nearly 60 countries with various different versions being produced. Amsterdam is a city of great culture, and is a wonderful place to visit for those wishing to learn more about what the city has contributed to the Western World. 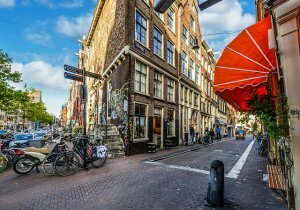 Amsterdam Hostel Uptown offers affordable accomodation for tourists and is centrally located, allowing easy access to sites of interest.